Click to View Larger...A lot of great things were created in 1959, (ie: I was born in 1959,) but this aint one of them. "Plan 9 From Outer Space" (1959) was a science fiction "epic" from the persistent, yet talentless producer/director/actor Ed Wood Jr.
IMDB.com Storyline: "Can your heart stand the shocking facts about Grave Robbers from Outer Space?" That's the question on the lips of the narrator of this tale about flying saucers, zombies and cardboard tombstones. A pair of aliens, angered by the "stupid minds" of planet Earth, set up shop in a California cemetery. Their plan: to animate an army of the dead to march on the capitals of the world. (The fact that they have only managed to resurrect three zombies to date has not discouraged them.) An intrepid airline pilot living near the cemetery must rescue his wife from this low-budget terror. "Can you prove it *didn't* happen?" Isaac Hayes performing The Theme from Shaft in 1973. The dude introducing him, just in case your recognizin' functions aint operating properly, is Jessie Jackson. dolemite posterDolemite was a character Rudy Ray Moore (3/17/1927 – 10/19/2008) developed after hearing a homeless man do a rhymed toast about "Dolemite". He included the character on his 1970 debut album, Eat Out More Often, which reached the top 25 on the Billboard charts. He released several more comedy albums using this persona. In 1975, Moore decided to create a film about Dolemite, using many of his friends and fellow comedians as cast and crew. The film was directed by D'Urville Martin, who appears as the villain Willie Green. Dolemite.com is a resource on the web for all things Dolemite. As well as claiming to be the largest repository Dolemite information, they also include an ebonics primer, and a Blaxploitation are on their site. The Rudy Ray Moore page on Facebook and the Rudy Ray Moore website are both excellent repositories of info about both Rudy and the Dolemite character. According to newspaper and magazone articles from the 70s, Dolemite cost $100,000 to produce, and grossed over $12 million. There was a Dolemite sequel, "The Human Tornado". 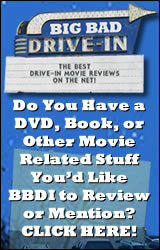 This film will be reviewed at a future date by "Big Bad Drive-In". Actor John KerryActor John Kerry had a supporting role in Dolemite as a racist cop. Kerry would play a similar role 35 years later in the movie "Black Dynamite". Merely one of a thousand mini tributes in the movie to 70s blaxploitation movies such as Dolemite.